Restaurant Booths: What Features Should You Consider? Buying restaurant booths for your cafe, restaurant, or dining hall can seem complicated at first. You might be overwhelmed with all the available options or different upholstery choices. Here, we break down the options and features to make your purchase as simple as possible! First, let’s talk size. What size restaurant booth fits your space and style? Standard double restaurant booth features vinyl upholstery. Single v. double: Do you know the difference between a single and a double? 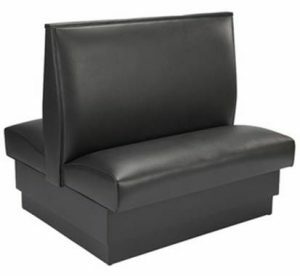 A single is merely one booth bench – the back is flat and can be placed against a wall if desired. A double booth has two back-to-back benches. Double booths can save you money if you are creating back-to-back seating along a wall. Length: A standard booth is 48″ long. That booth seat length comfortably sits 2-3 people. A single person booth seat is available for order at 24″ or 36″; these smaller booths are often called deuces, because paired with the opposite bench or a chair, the table configuration seats a total of two people. Many restaurants mix the standard booths with deuces to create more flexibility in seating and take advantage of space constraints. Plus, if you have deuces in your restaurant, two-person parties won’t eat up more seats than necessary, and also, deuces tend to produce a quick table turnaround time. When choosing seating lengths, keep in mind that you need about 20″ per person. Seat depth: Booths tend to be a little roomier for guests than the average restaurant chair, which usually has a 16-17″ seat depth. Most booths on the market offer an 18″ seat depth, and our booths feature a 19″ seat depth for ultimate comfort. Overall height: The height of booths are measured from the ground to the top of the back – the overall largest height of the booth. A standard booth tends to be 42-43″ high. However, shorter booths are available at 36″, and taller booths are also available for order at 48″ high. When creating your space, height is a critical element. Do you want to create social flow? Have windows that you do not want obstructed? Going for an open and airy atmosphere? If so, you will want to consider the shorter booth height. But if you are trying to create privacy or a more cozy, intimate seating for your guests, then a taller booth height is ideal. Consider your brand and the style of your space before choosing the right overall height of your booths. Table size: We recommend pairing a standard 48″ long booth bench with a 30″ X 48″ restaurant table top. We also recommend using that table with either a booth mounting base or two 5″ X 22″ end bases, however a 24″ disc base or a 30″ X 30″ x-style base could also be used. Keep in mind that you will want the same length table as your booth bench, so they match up. If you need help selecting the correct table base, please let us know! Secondly, let’s consider your upholstery and finish options. Vinyl: Did you know that vinyl is measured by weight in ounces to determine its quality? The higher the ounce, the better the grade of vinyl, and the more durable it is for commercial uses. The ounce weight is measured by linear yard. In addition to ounce weight, manufacturers and vendors of vinyl-made products often introduce a scale to measure their own product qualities. These scales are not necessarily uniform across the entire industry, so the key factor in comparing vinyls between competitors is looking at the difference in ounces. Sometimes, you’ll see Grade A, B, C, etc. vinyl, and sometimes, you’ll see Grade 1, 2, 3, etc. vinyl. Most hospitality industry vinyls are named in the Grade 3-7 range, and higher grades outside that range would be a marine grade vinyl (such as that you’d find in a boat). A normal ounce weight range would be 22-37 ounces for a standard commercial vinyl. The better grades of vinyl feature stronger backing to prevent rips and tears. On our restaurant booths, you can choose a standard 22-ounce vinyl, or select from different vinyl lines which come in higher quality grades. Most vinyl restaurant booths come with a 1-year warranty on their upholstery. It’s important to note that the type of stitching and seams used can decrease the amount of wear in certain spots on the booth. Vinyl can wear over time, and it can even rip and tear. It’s a great economical choice for your restaurant booths and can be replaced relatively easily. Fabric: Fabric upholstery on your booths adds more style. Because fabric comes in a number of patterns and designs, fabric offers many new looks to your restaurant booth. Sometimes, restaurants can even supply their own fabrics for a custom designed restaurant booth. Fabric tends to ignite a more upscale feeling than vinyl. Sometimes, booths have vinyl seats but feature a fabric back. Plastic/Laminate: Economically speaking, a plastic/laminate booth is often the least expensive option. That’s why they pop up in pizza joints and ice cream shops a lot. They also have a home in many quick service restaurants, much like your favorite fast food chains. They are popular at snack bars and in cafeterias. Offered in very simple designs, there are typically no upholstery or cushion options with a plastic/laminate booth. We currently do not offer a plastic/laminate booth, but we can help you find a vendor if that is the right booth look for you. Wood: Is your restaurant decor more rustic? Trying to create a warm, traditional vibe? Want to add booth seating in a more classical, or even upscale, way? Wooden restaurant booths might fit your brand the best. Or, consider adding wood trim to your upholstered booths for a more detailed and finished look. Once you know wood is going to be visible on your booths, you’ll need to choose what wood species will give you the right look! Oak, maple, and cherry are popular hardwood finishes for booth construction. Oak is probably your most traditional wood finish and looks great in country, rustic decors. Maple offers a lighter, brighter finish, great for contemporary or more spatial, open designs. Cherry provokes a more upscale or fine dining sense. Next, let’s look at all the style options. Crumb strip: Have you ever been part of the waitstaff or a bus team at a restaurant? Then you know how tricky it can be to really clean off the booth seats, when crumbs fall in the crack between seat and back, especially, when you are standing in the aisle and trying to reach in the back corner to get a good swipe of your rag. Restaurant staff will love the addition of a crumb strip, which leaves room behind the seat and below the back to wipe out all the crumbs. Your customers will notice a clean restaurant, and I’m sure your Health Dept. inspector will be impressed, too! By adding functionality with just a narrow strip on your restaurant booth designed to catch loose crumbs, you can save your staff time and create a cleaner restaurant. Channel design: The back of a booth can be visually divided with vertical seams to create multiple channels. We offer a three-channel booth design in our quick ship restaurant booth program. The most common channel-back designs feature 3, 4, or 6 vertical channels. However, you can find horizontal channels or even V-back channel designs. Channels are separated with seams or stitching to provide linear division for aesthetic appeal. Head roll: Many booth sellers create a head roll option. A head roll is a long horizontal piece that runs at the top of the booth back. It can either be similar to a cushion or pillow that sticks out further from the back or simply be a change in color, fabric, or pattern than the rest of the booth back to add another type of aesthetic appeal in some designs. We currently do not offer a standard or quick ship booth with head roll, but we are willing to do custom work and can discuss your head roll needs when building your booths. Finally, what custom choices do you need in your booth? Do you have specific needs for your restaurant booth design? Perhaps, you want a 54″ length to fit larger parties, or you want the booths to be bar height, so you can use your bar height table bases. What you want and what your space demands matters when you order your restaurant booths. We are here to help and can most likely match your design needs. Your satisfaction is important to us. Our custom-made projects produce some of our favorite items! We’ll be happy to discuss the options with you. Did this article help answer your questions about purchasing the right restaurant booth? Let us know your feedback! Posted on Aug 16, 2012 in Design and Furniture Selection, Helpful Tips for Bar and Restaurant Owners • Comments Off on Restaurant Booths: What Features Should You Consider?